Since one of my giveaways just ended, here’s another one! Yaay! 2. Follow me on Twitter and tweet: “OMG! I want to win those summer necklaces at www.sophiemos.com!” No need to tag me! Make sure to set your twitter accounts on public so that I can verify the tweet. 3. Like Sugar-Kissed on Facebook. +5, post this as your Facebook status:“OMG! 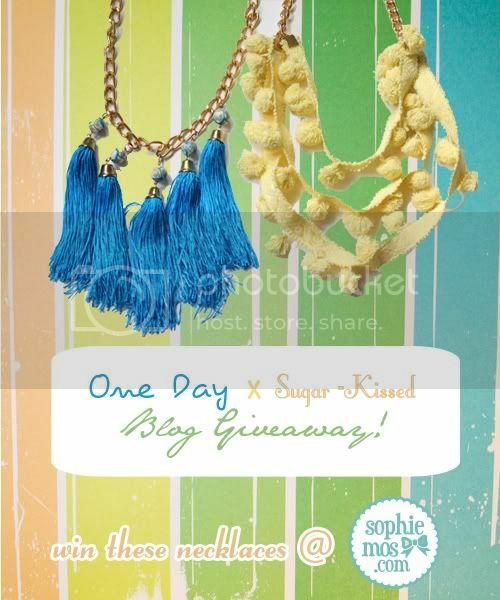 I want to win those summer necklaces at www.sophiemos.com!” Make sure you tag Sugar-Kissed and your account is set on public, so that I can verify it. After completing the mechanics, don’t forget to fill out THIS FORM!